A single player memorabilia set featured on the iconic 1948 leaf design and featuring legends from the early part of hockey history! Such as Georges Vezina, Cyclone Taylor & Percy LeSueur. A single player memorabilia set utilizing the 1960 Leaf design and featuring legends from that era! Such as: Gordie Howe, Maurice Richard & Jean Beliveau! Single player signature card featuring the iconic 1990 Leaf Baseball design! Look for Signatures of superstars from that era such as: Mario Lemieux, Sergei Fedorov & Brett Hull! A single player memorabilia card featuring the iconic 1990 Leaf Baseball design! Look for memorabilia cards from legends such as: Jaromir Jagr, Steve Yzerman & Dominick Hasek. A single player memorabilia card featuring legends spanning all of hockey history such as: Tim Horton, Bill Barilko & Stan Mikita. 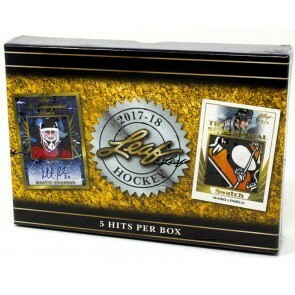 A signature set featuring legends and heroes from Hockey Lore. Such as: Phil Esposito, Jean Ratelle & Martin Brodeur. An impressive jumbo patch card featuring legends and heroes. Such as: Paul Kariya, Mario Lemieux & Larry Robinson. single player six swatch memorabilia insert set featuring those that have earned battle scars behind the mask such as: Jacques Plante, Terry Sawchuk & Grant Fuhr. A dual player memorabilia card featuring a legend and an heir to the throne! Such as: Maurice Richard/Jean Beliveau, Jacques Plante/Ken Dryden & George Hainsworth/Bill Durnan! A dual player memorabilia card featuring all-star heroes such as: Sergei Fedorov/Alexander Mogilny, Mario Lemieux/Jaromir Jagr & Paul Kariya/Teemu Selanne. Leaf Buyback signatures: autographed buyback cards from the beautiful 1993-94 Leaf Hockey Series! Featuring buyback signatures of: Pavel Bure, Mario Lemieux, Sergei Fedorov, Brett Hull & more!